We developed an aqueous resin type inkjet ink excellent in safety, color reproducibility and jetting-reliability. Further, beyond being able to print on non-osmotic plastic base materials (PVC, PET, etc. ), it can also print on osmotic base materials (paper, etc.). What is aqueous resin type ink? Generally, aqueous resin type ink is a heat-fusing type, which allows printing on various un-coated base　materials even though it is a water-based ink. Handling is similar to water pigment ink, but it can be fused to the base material like a solvent ink, making it waterproof and robust against scratches. The aqueous resin type inkjet ink Ricoh developed uses technology of water-based ink which is mainly diffused in household inkjet printers. In the aqueous resin type ink, human safety is carefully considered. Solvent ink and UV ink, which have mostly been used for plastic base material applications, needed to be labeled as hazardous on the Globally Harmonized System of Classification and Labelling of Chemicals (GHS). This requirement resulted from the classification and labelling of chemical articles urged by the United Nations. In contrast, because safety of the materials contained in Ricoh's aqueous resin type ink has been carefully taken into account, the Ricoh ink requires no hazardous label. Neither does it need special ventilation for the printer, making it usable over wide-ranging printing applications. Ricoh's aqueous resin type ink has a collection of color inks that include characteristic color inks such as orange and green, and a white ink; these are in addition to the process colors (cyan, magenta, yellow, black). Characteristic color inks make possible broad color-reproduction even for the sign graphics applications often used for printing photographs of ordinary commodities, characters, and the like (Fig. 1). Regarding the white ink, because of its high opacifying properties, it can obtain high contrast when used for surface coat printing on transparent base materials such as shop front signboards; images are produced with good visibility. 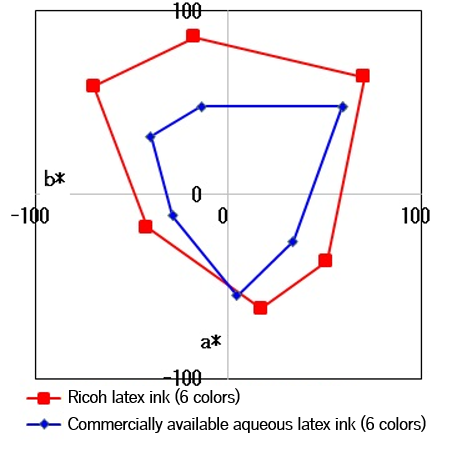 In addition, by using the homogeneous dispersion technology of the pigment, Ricoh's aqueous resin type ink can obtain stable image density (Fig. 2) for polyvinyl chloride (PVC) and PET films and the like, which are often used for sign-graphics applications. Further, the ink has a special feature to produce high density, not only on plastic base materials but on paper as well. It can be adapted to a broad range of base materials. In an inkjet system, reliability is especially important. 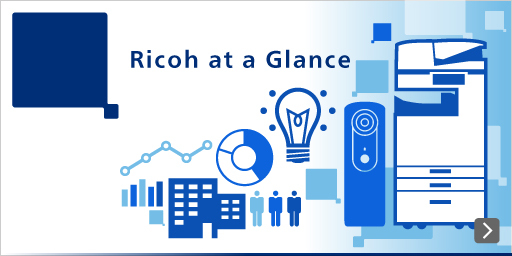 Ricoh's aqueous resin type ink achieves high jetting-reliability through high stabilization technology. Generally, to obtain high confidence in an inkjet system, many contrivances are exercised on ink, inkjet head, and the reliability conserving mechanism, etc. 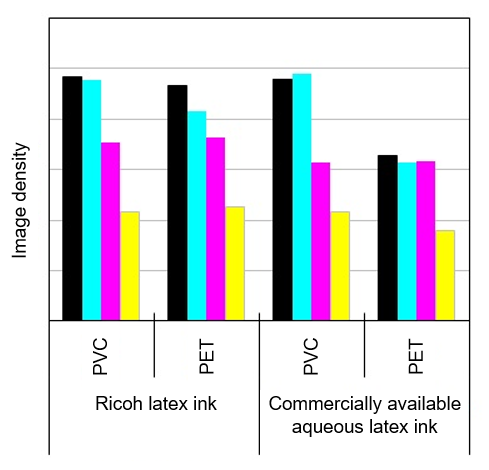 With Ricoh's aqueous resin type ink, however, high confidence is possible without mounting complicated mechanisms in the inkjet system of the piezoelectric system. In addition, because stable images are obtained also in continuous printing, which is especially important in commercial printing, automated operation at night can be done with ease. In summary, the aqueous resin type ink developed by Ricoh is safe, and it features broad color gamut, broad base-material adaptability, and high jetting-reliability, allowing printing on varied base materials. Sorted by : field "Printing" "Industrial Solutions" | product type "Industrial Inkjet"